Basing is a huge thing for me. I don't think there is one other thing that you can do to your army that will have as big an impact as basing. There is a ton of info on the web about this. To this day I find it hard to believe that people don't base their models, it's so easy and it has such a huge impact on the final look of your army. Today's post is about basing with materials you can find around your home for free. Nothing was bought for this project. 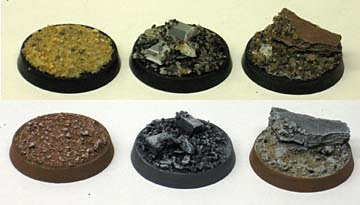 The addition of other materials like static grass, specific bitz from your bitz box, sculpting clay, wire, etc... can really enhance your bases but it doesn't take spending money to come up with some nice bases for your squad or army. Paint: Thin coats and washes, material can be easily obscured with layers of paint if not careful. Good with light, delicate drybrush to bring out subtle detail. Paint: Regular paint and drybrush for detail works great. Thinned paint helps flow into recesses better. Paint: Regular paint, can be thinned to get into recesses. Drybrush to bring out details, no need to worry about obscuring texture. Use: Resembles just about anything, can go from dirt to rough, rocky areas. Can be a drawback with this material as there is no guarantee what you'll get sometimes. 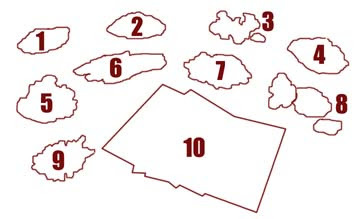 Less control than with other materials that are limited in categories (i.e. sand). Paint: Depends on what you get, regular paint works, maybe thinned down. A careful drybrush afterwards so you don't obscure the smaller details and you'll be fine. Use: For variety, can be added one at a time for effect. Can be cut down to size and placed upright for tree stumps if desired. Use: For variety, can be added one at a time for effect. Great rock outcroppings. You may want to coat these with superglue for stability before painting and using. This type of bark has a tendency to break apart sometimes. Use: Great at representing loose bricks and blocks that are lying on the ground. Just take a pair of snips and cut the size blocks you want. Use: Can be cut to size and layered on your base for effect. Helps build up portions underneath your texture. Paint: (Not applicable) Regular paint works fine and you can cover it with a thin coat of white glue for stability before painting. So there you have it, a tone of material you can find by looking around where you live. And all for free. As far as glue, I don't use anything specific other than a cheap superglue and white glue for putting everything together. Don't forget your color schemes and a theme for your bases. Taking the extra step and planning something out that you can carry through your whole army really has an impact on the final result. And just to show you what can be done, here are three sample bases I did using the materials I found. Good luck with your basing. Make sure to take that extra time and effort, believe me... it's worth it. LOL! Ron, you continue to amaze me by taking common "junk" and turning it into stuff that looks, so real and like it was made that way from the start. It the cost saving things that I like the most. I just can bring myself to buy some things that I can get for free elsewhere. GPS coordinates to "flower planter in front yard"? I could use some of those items in your flower pot. Something I've found to work out very well but it can take years to build up - the deposits under your roof's gutter drainage (as long as your drains don't go right into the earth). This is usually a very fine silt and small particles of roofing material. The older the house, the better the build up. Works as dirt or ashes. Sometimes I'll check my gutter downspouts after a good rain too. You can find a good pile of the stuff you're talking about. The bark chips are genius. don't you find though that if you cover your bases in sand they look like a bunch of idiots who've fallen in a long jump pit when they play on a grass or urban style board. Basing only looks good on a board made of the same type of stuff eg sandy bases on a desert map and when this happens it looks really mega cool. Thats why i never play with nids any more. tyran: Not at all. I think a well done and "theme based" army, even if it is contrary to the board we're playing on makes that army look great. Now, if the army's base and the board happen to match, even better. But if they don't, that's never been a problem for me at all. I'd much rather play against an army that has a finished basing theme than one that isn't based at all if given the choice. Tank your for your ideas!